Milan, 1490. An expert painter, sculptor, and engineer completes his rendering of the human body. Known as the Vitruvian Man, this drawing blends art with science and illustrates Renaissance theories of proportion and symmetry in the body previously described by the Roman architect Vitruvius in his treatise, De Architectura. The artist is Leonardo da Vinci, and the masterpiece that combined his own observation of human bodies with theories from the ancient text would become a critical teaching tool and anatomical guide for centuries to come. Atlanta, 2014. More than five hundred years later, Michael Konomos (at left) sits in his office on Emory University’s campus. 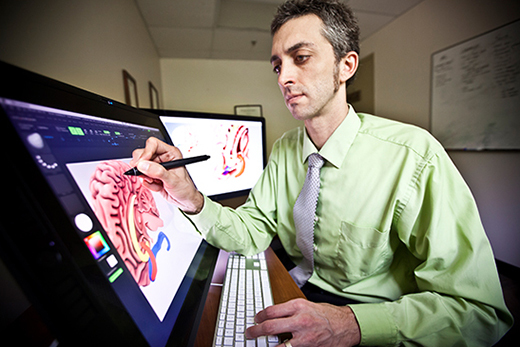 He draws directly on the screen of his computer monitor with a digital pen to refine a 3-D image of the human brain. As the lead medical illustrator for Dean Christian Larsen’s office at the School of Medicine, Konomos has worked on a number of 3-D visualizations of various parts of the human body. He previously developed the Surgical Anatomy of the Liver app for iPad that is already being used in surgical education. In another skillful combination of science and art, 3-D visualizations of the brain created by Konomos help illustrate deep brain stimulation (DBS) research led by Emory professor and neurologist Helen Mayberg, Dorothy C. Fuqua Chair in Psychiatric Neuroimaging and Therapeutics. Mayberg heads a multidisciplinary program at Emory dedicated to studying depression and the effects of antidepressant treatments, including DBS. She and her research team have developed reconstructions of the human brain—computer models based on imaging data gathered from actual patients—to personalize the selection of a best treatment, be it cognitive behavior therapy, medication, or DBS, based on brain scan patterns. The team’s most recent imaging studies also are being used to refine and optimize the surgical targeting for patients undergoing DBS. Mayberg pioneered the use of DBS in a region of the brain known as Area 25 more than ten years ago. Her team is testing to determine if these new computer reconstructions can improve the targeting of Area 25 and adjacent white matter bundles critical to achieving antidepressant effects. People with severe depression that does not respond to talk therapy, drugs, electroconvulsive therapy (ECT), or a combination of these treatments participate in Mayberg’s research. Some participants have struggled with depression for most of their lives.